Signal Gallery are delighted to to be introducing the work of Brooklyn street artist RAE to London. RAE has made a name for himself in New York with a series of lively installations on the street combining sculpture made up of found objects and painting. 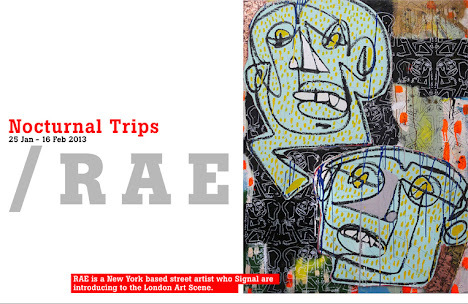 His work has a intelligent and witty quality which comes across as 'very New York' to us Londoners. Placement is very important with some works finding their way onto apparently inaccessible spots (e.g. on the top of lamp posts). 'Nocturnal Trips' will be his first show in the UK. The title refers to the nighttime 'trips' he takes to plan and install his artwork on the street. The city is a very different place, especially when you are seeing it both as a blank canvas and the potential scene of your arrest. It also refers to the thought processes that can happen in the dead of night when you're unwillingly awake. This can be a feverish state where extravagant ideas are bubbling up in a way that couldn't happen in the sane light of midday. RAE has tried to capture some of the semi-dream state images in the works for his show. Opening Times: Tues-Sat 12-6 pm, and by appointment at other times.